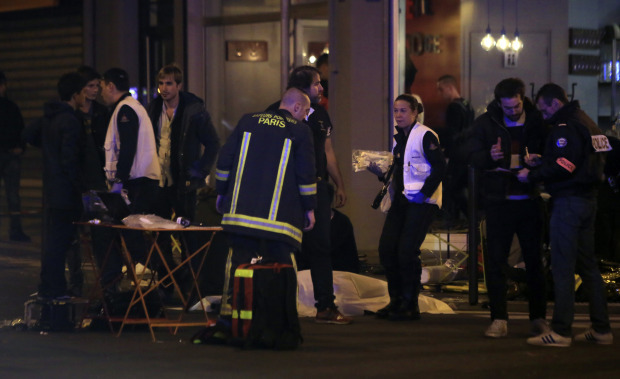 The horrible attacks which took place in Paris on Friday evening, killing 120 people and causing dozens of casualties, this blind violence provokes revolt and indignation. The NPA shares these feelings and expresses its solidarity with the victims, with their close relations. This tragedy is even worse in that it hit innocent victims, the murderous attacks were aimed at the population. This contemptible cruelty in central Paris responds to the equally blind and even more fatal violence of the bombings by French planes in Syria following the decisions of François Hollande and his government. These strikes are supposed to fight the Islamic State, the terrorist Jihadists, but in fact, with the Russian intervention and bombings, they protect the regime responsible of the martyrdom of the Syrian people, the dictator Assad. And in fact there too the civil populations are the first victims condemned to live under terror or to flee at the risk of their lives. Imperialist cruelty and Islamist cruelty feed each other. And do so to control oil supplies. Rescue workers in Paris after that November 13 attacks. In a pitiful intervention, Holland broke down and stammered some words on the Republic. He who plays the war leader and carries an enormous responsibility in this new tragedy asks for “confidence.” He decreed a state of emergency throughout France, considering that the answer was to trample on fundamental freedoms. He was immediately supported by Sarkozy. The political authorities can thus from now on ban public meetings and control the press. Once again, the main people responsible for this surge of barbarian violence are calling for national union. They are trying to turn the dramatic situation to their advantage to choke off indignation and revolt. They have a ready-made scapegoat, Muslims. We reject any national union with those responsible for wars, the bourgeoisie, Hollande, Sarkozy, and Le Pen. We denounce the racism that the State vehicles in the name of alleged “values of the republic” at the time when, in the guise of fight against terrorism, democratic rights are threatened. We ask for the lifting of the state of emergency. The only response to wars and terrorism is the unity of workers and people, over and above their origins, their skin colour, their religions, across the borders, to fight together against those who want to silence and to dominate them, to do away with this capitalist system which generates cruelty. To put an end to terrorism, it is necessary to put an end to the imperialist wars that aim to perpetuate the plundering of the wealth of the peoples dominated by the multinationals, to force the withdrawal of the French troops from all countries where they are present, in particular in Syria, in Iraq, in Africa. This statement is from the French New Anticapitalist Party (NPA), and was originally published in English by International Viewpoint. Paris attack was full of cruelty and was inhuman. To end the cruelty imperialist wars should be ended first. bad time for Paris. RIP!